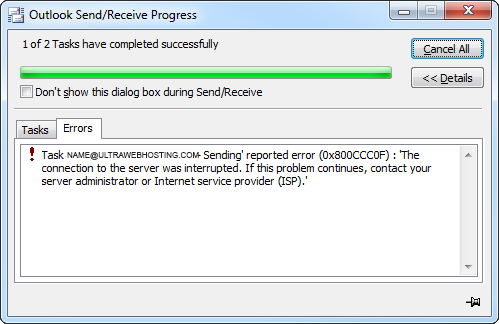 This error message occurs when Microsoft Outlook or Microsoft Outlook Express cannot establish a connection with your e-mail server. To work around this problem, use one of the following methods as appropriate for your situation. For information about the correct settings for your e-mail server, view your welcome email. Make sure the domain name has fully propagated. If it has not you may either connect via IP or wait for propagation to take place. Insure you have an internet connection. If you are using a virus scanning program such as Norton change its settings to only scan email on send and delivery. Close any applications that would cause an interuption in internet connectivity. Scan and remove spyware on your system that may cause interuptions in internet connectivity. 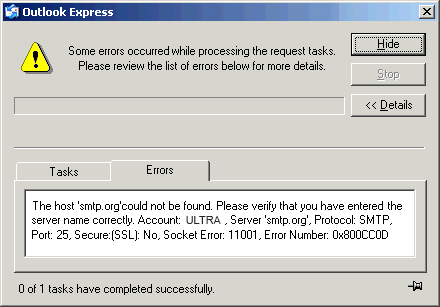 How do I set up Outlook or Outlook Express 5.x? Outlook: The Message Could Not Be Sent. An Error Has Occurred.